SPOTLIGHT: Yesterday I was supposed to feel guilty about my carbon footprint. Today it’s my plastic footprint. BIG PICTURE: The vast majority of the plastic polluting the ocean appears to come from just 10 rivers in Asia and Africa. These developing countries have no waste management infrastructure. Garbage collectors don’t come round to pick up the trash. Properly managed landfills and European-style incinerators don’t exist. Instead, garbage is routinely tossed into waterways, and then ends up in the ocean. This is a serious problem. But if environmental groups were serious about solving it, they’d pool their considerable resources and concentrate their efforts on those 10 rivers. After accomplishing that real-world task, they’d focus on the next ten. But no. 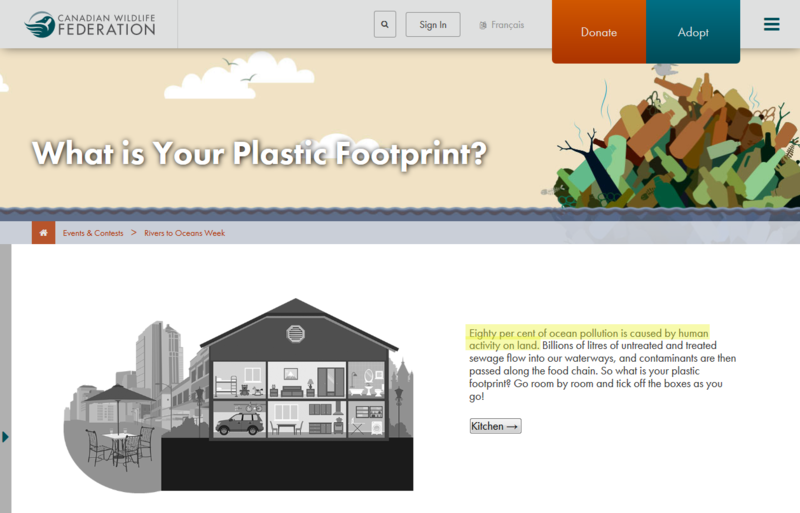 Groups such as the Canadian Wildlife Federation are urging me to tally up my ‘plastic footprint.’ Its website invites me to survey different rooms in my home: kitchen, bathroom, laundry room, bedroom, garage, and beyond. There’s no part of my life these moralistic scolds don’t disapprove of. Since my household trash is picked up at the curb, is disposed of in a responsibly-managed landfill, and goes nowhere near a waterway, this is an insane exercise. A total waste of time. Do they really imagine I’ll click that big old ‘Donate’ button at the top of their website after being told my rubber boots aren’t green enough? The Canadian Wildlife Federation declares that “Eighty per cent of ocean pollution is caused by human activity on land,” but fails to mention this is overwhelmingly a problem involving poor countries thousands of miles from Canada. The only way the plastic in my life has the remotest chance of polluting a waterway is if I litter – something most of us are already careful not to do. In the Canadian context, the plastic crusade is a glorified anti-litter campaign. TOP TAKEAWAY: Rather than pointing out that polluted waterways are one more reason not to litter, the Wildlife Federation has chosen to demonize all plastic instead. This entry was posted on June 11, 2018 by Donna Laframboise in quotations and tagged Canadian Wildlife Federation, plastic.